Asteroid 2011 AG5, measuring 460 feet (140 meters) wide, will not hit Earth in the year 2040, scientists have confirmed. A huge asteroid that will creep near Earth in 28 years will pass harmlessly by, a new study confirms. New observations of the asteroid 2011 AG5 now give astronomers complete confidence that the 460–foot-wide (140 meters) space rock won't hit Earth in the year 2040. When it was discovered last year, scientists said that 2011 AG5 had a 1-in-500 chance of impact with our planet. Astronomers solidified the asteroid's harmless status during an observation campaign in October using the Gemini North telescope in Hawaii. 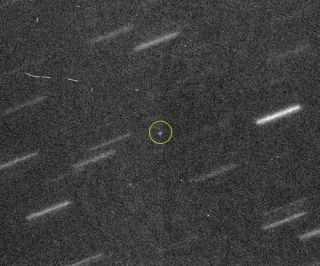 The finding added more support to a NASA study that came to a similar conclusion in June based on months of observations of asteroid 2011 AG5. But now, judging by the path of the two-football-field-sized asteroid, it shouldn't get any closer than 550,000 miles (890,000 kilometers) — about twice the distance between the Earth and the moon — when it zips by our planet. "These were extremely difficult observations of a very faint object," Richard Wainscoat, a member of the team of researchers that monitored 2011 AG5 said in a statement. "We were surprised by how easily the Gemini telescope was able to recover such a faint asteroid so low in the sky. "Just because it is a large asteroid, doesn't mean it is easy to see, scientists said. Researchers used the Gemini North to photograph the asteroid three times in October. NASA astronomers and other scientists regularly monitor the sky for asteroids that could pose a potential impact threat to Earth. About 9,000 such near-Earth asteroids have been discovered to date, though up to a million or more could actually exist, NASA scientists have said. Nearly 95 percent of the largest near-Earth asteroids, those larger than one kilometer in size, have been identified, NASA scientists have said. The space agency's Asteroid Watch program to monitor nearby space rocks is based at the Jet Propulsion Laboratory in Pasadena, Calif.